Bike Safe has launched an appeal to upgrade the Queenscliff Portarlington Road on the Bellarine Peninsula. This road has been a nominated hazard road by Bike Safe for the past 7 years, with as yet no plans to address this issue by VicRoads, nor the State Government. THIS HAS BEEN AN IDENTIFIED PROBLEM BY BIKESAFE SINCE 2010. Weekly incidents occur between vehicles and cyclists. 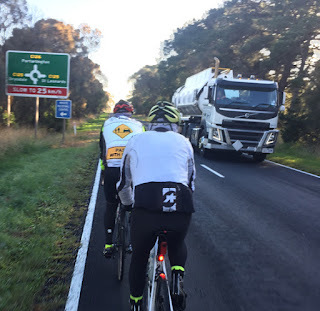 Safe touring, by both cyclists and motorists, around the Bellarine Peninsula is impeded by poor infrastructure, specifically on the Queenscliff Portarlington Road (C126) and Murradoc Road (C125). Resurfacing works have been poor band-aid measures, only maintaining road designs dated back 30 years. Even limited shoulder works near the Bellarine Highway are not to AustRoads Standards and basically unusable by cyclists. The dangers have been contributed to by increased development, heavy vehicle use and population growth. The restricted road width, deteriorating surfaces, very poor or non-existent road edges, as well as excessive speeds, all are key hazard contributors. There is no alternative off road leisure path, such as the Bellarine Rail Trail, from Portarlington, St Leonards and Indented Heads to and from Queenscliff, Point Lonsdale and Ocean Grove. Bike Safe is advocating for the entire Bellarine Rail Trail to be sealed, to at least enable some alternatives from Drysdale to Queenscliff. 1. Reducing the speed limit from 100km/h to 80km/h. 2. Widen the roads to incorporate shoulders to AustRoads Standards relevant to the new speed i.e 2 metres where possible, minimum 1.8 metres width both sides. Queenscliff Portarlington Rd (C126) at least the 7kms from Knights Rd to Murradoc Rd. Murradoc Road (C125) at least the 3kms from Queenscliff Portarlington Rd to Bluff Rd.